Yes I know, porridge. I really am not trying to invent the wheel and I am not trying to be smart, I just want you to know that this was delicious. There are around 60 days of chilly weather ahead and some cracking strawberries coming into season. So you will have time to try this. 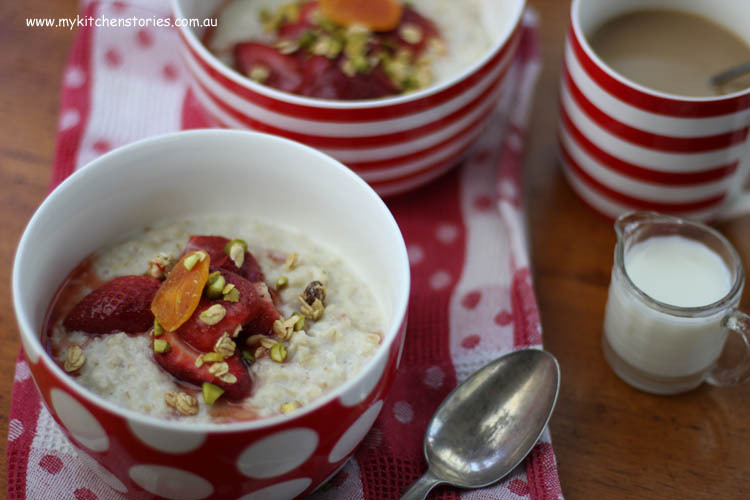 Look away if you are lucky enough to be in amongst beautiful summer weather, because here, in southern Australia, we have porridge weather. 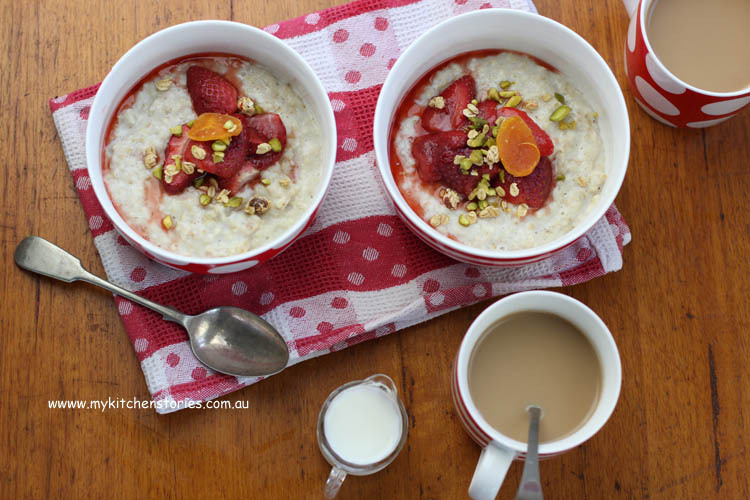 Strawberries were so cheap this week I was brazen enough to poach them in some maple syrup to eat with the organic oats I had in the cupboard from Kialla Pure Foods, in Queensland. 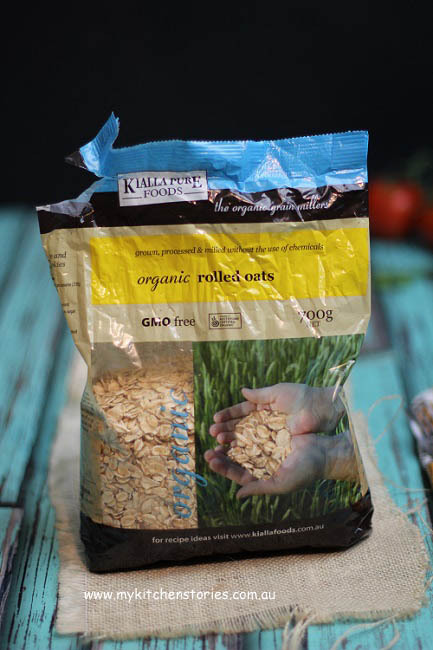 It really makes a difference to use lovely oats. Processed porridge in little sachets is definitely not worth eating. Am I lecturing you? Sorry. Any way. Just in case you need some breakfast inspiration, I’ve got it here. 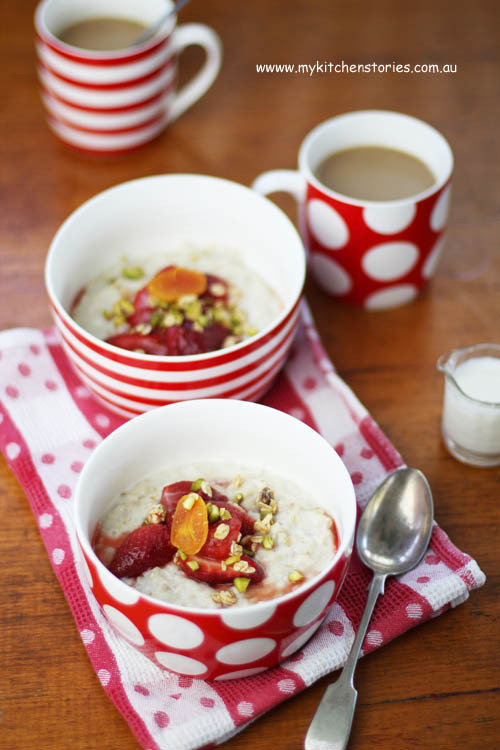 You could try making these oats with raspberries or bananas if you wanted. I added apricots and some crunchy muesli bits with nuts. Put the oats and water and milk into a pot and bring up to boil. Turn down immediately and simmer on low till the oats are softened and the water has evaporated.Turn off and put on a lid and sit for a couple of minutes. Put the strawberries in a bowl with the maple syrup and heat for 1 minute. This should be long enough for the strawberries to be softened and warm. If not, heat them at 1/2 minute increments till soft. This could also be done on the stovetop in a pot. 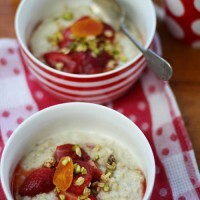 If the porridge is too thick and a little extra milk and warm through. 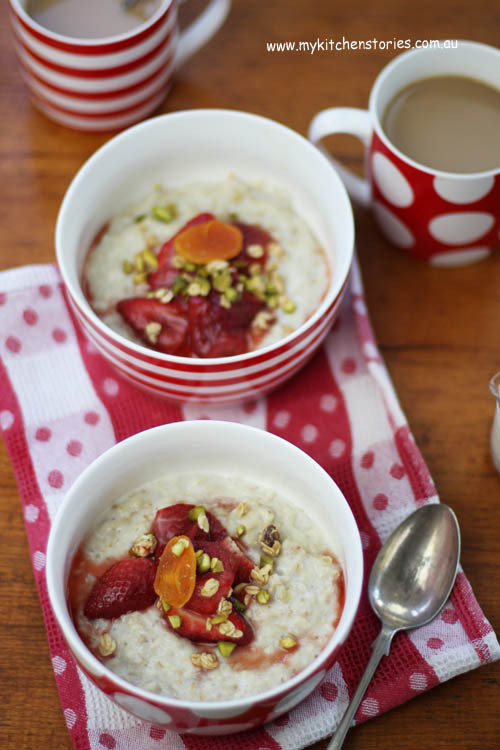 Serve with the strawberries in maple syrup and crunchy muesli on top. Maybe breakfast isn’t your oat thing. 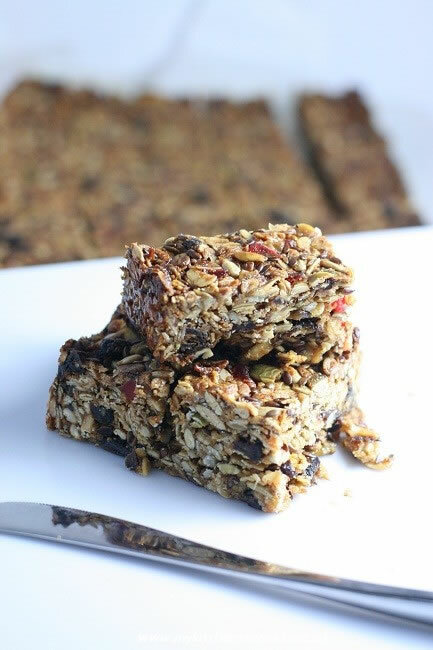 What about this great Muesli slice from the archives? This would have been wonderful early this morning but since it’s noon, I’ll wait til tomorrow to give poached strawberries a try. The berries are so good this year. Totally agree with you about the packages stuff… yuk! 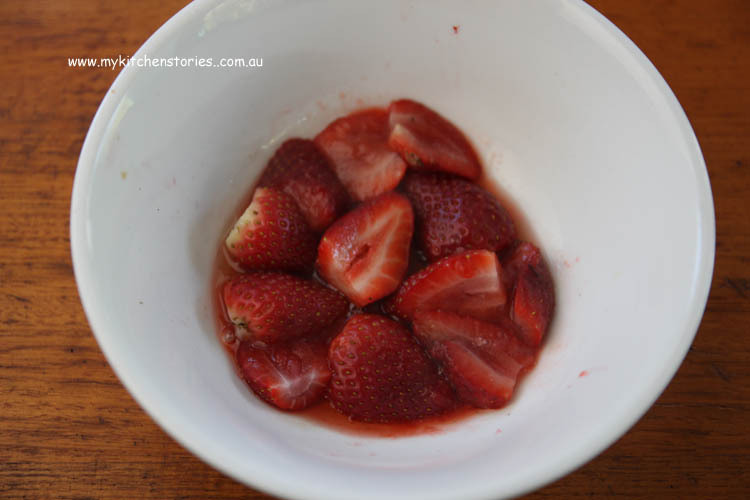 That is pretty brazen of you to poach strawberries (they must have been very inexpensive!) but yum yum yum. It’s getting a bit chilly in Brisbane in the mornings too. We go through so much porridge during winter! It’s such a filling, satisfying meal 😀 And hehe totally agree about those little packets of oats! This is the breakfast I have every morning but with blueberries or kiwifruit. Strawberries are not in season here right now but I do have some frozen ones I use occasionally.